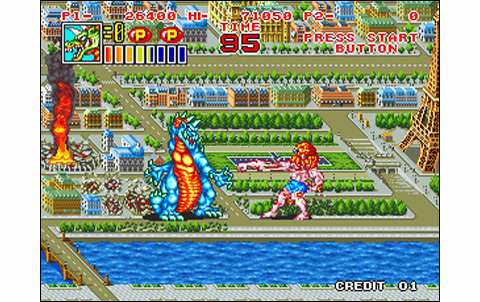 A long time ago, in 1991, it was released on the Neo Geo King of the Monsters, a fun wrestling game inspired by Atari's Rampage... but the comparison ended there! 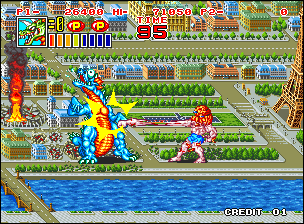 The SNK title featured japanese cities like Tokyo, Osaka, Nagasaki, becoming the theater of wrestling meetings between giant monsters! 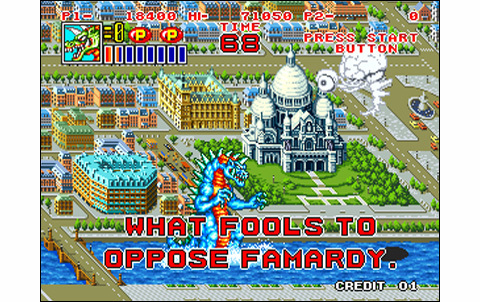 A fun and original principle, which had some success and impressed players with beautiful graphics. 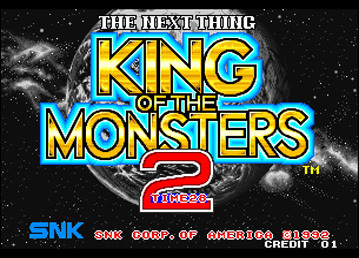 With this sequel - King of the Monsters 2 - the company has significantly changed the game style: from VS fighting/wrestling , this sequel became a kind of Beat them Up, since we have here to go through stages (or not) to confront Bosses at the end of each. 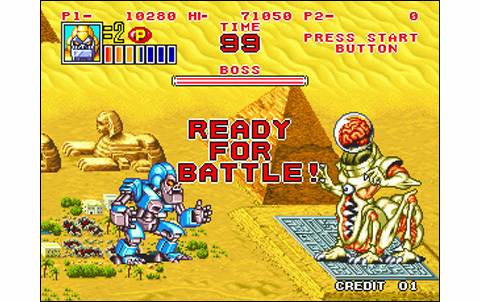 Among the six colossus from the first episode, only three survived: Astro Guy, Geon and Woo. 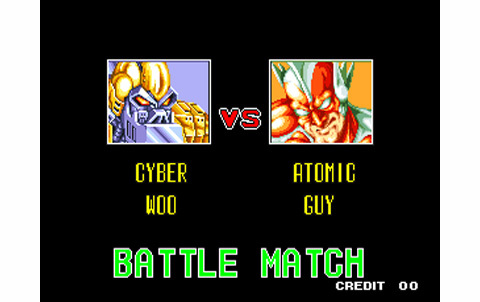 But they have evolved into Atomic Guy, Super Geon and Cyber Woo! The story takes place three years later: we now have to deal with aliens invading the Earth, and our monsters will have to kick butts (or perhaps have their kicked, we'll see...) all around the world. 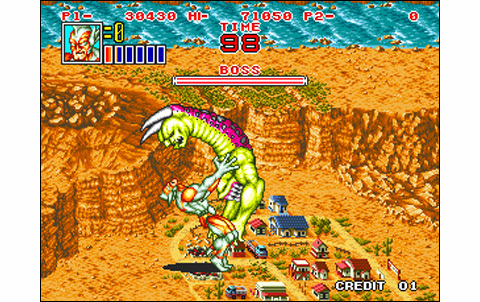 America, France, Ocean, Desert... You'll also have to fight against the 'human' armed forces, who instead of aiming at the invaders will target only you, but also against some minor enemy creatures and of course the infamous Bosses. 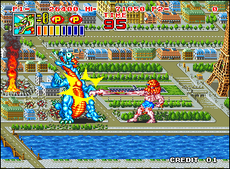 The realization, which was already far from bad, has improved since the first game: the graphics are more colorful and varied, the cities are beautifully designed with great detail, and the various monsters are awesome. 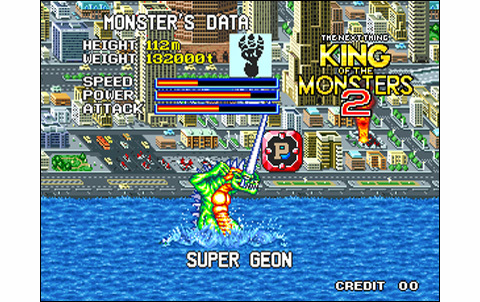 Very pleasing to the eye, KOTM2 is also lively and dynamic, with many animations and a good decomposition. The soundtrack is discreet and less successful than the first, but this is just a detail... as the game suffers other defects which will clearly prove prohibitive for most players, as we shall see. 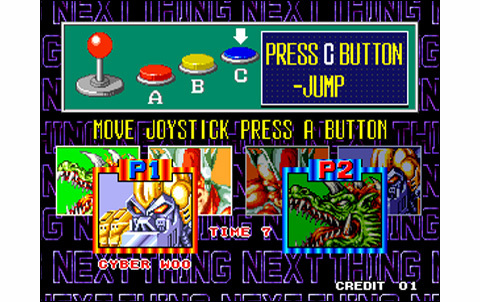 The controls have changed a bit, and the combat system has been considerably simplified: punch, kick, jump. 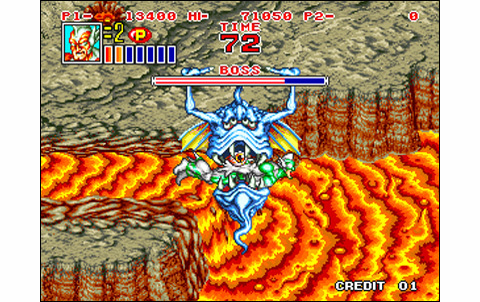 It's no longer possible to run, there is only one jumping attack, and each monster can perform only two different throws. Finally, holding A or B charges two different special attacks. 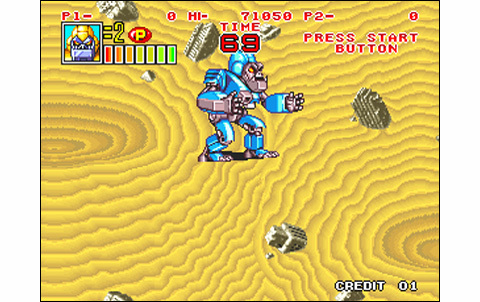 Controls look now much more like a Beat them Up game than a wrestling one, and the range of moves became restrained. 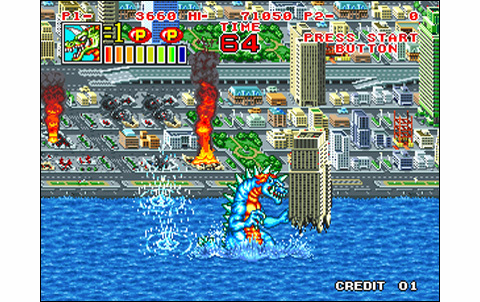 The power-up to pick during stages are upgrading our heroes on two levels, but it's also possible to recover some life by destroying the buildings. 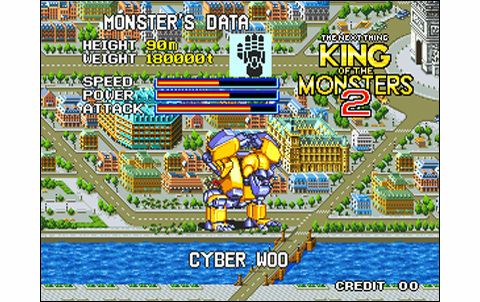 Moreover, our monsters can seize these buildings and also vehicles to use it as projectiles... but anyway, you can simply destroy them! 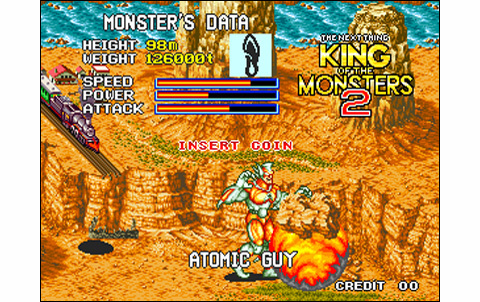 KOTM2 can plays alone, in a 1P vs 2P match, or two against the machine: nice! 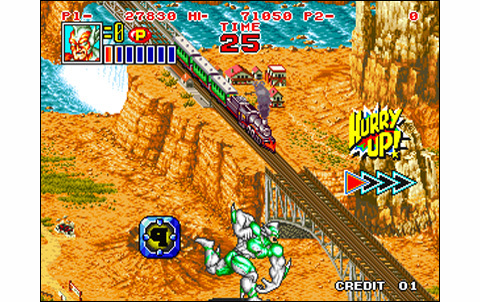 In addition, the game is punctuated with nice bonus stages, which makes it even smarter. 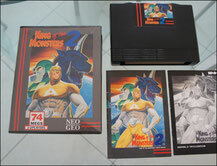 But then, what's wrong with King of the Monsters 2? It's simply the gameplay that ruins everything else. 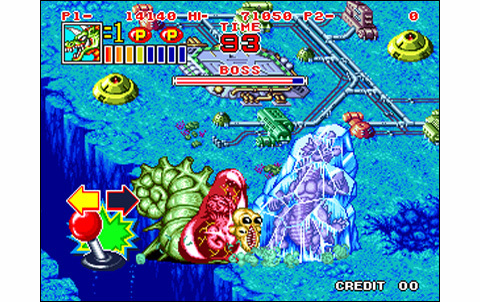 With an ultra limited principle, short stages summarizing at best a dozen enemies on a few screens, followed by long and painful fights against Bosses, there is nothing to excite crowds. In addition, there's only three different characters available. 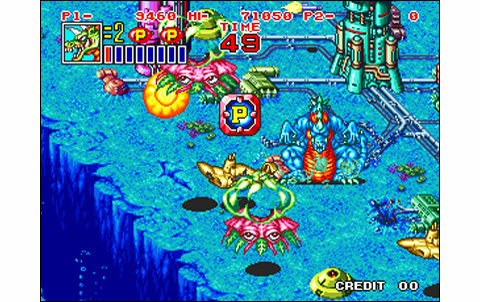 But with good controls, and a fun game system this game would pack everything we need, don't you think? Ahem, I would tell you. Fighting against the machine invariably turns into humiliation. The melee comes down to random priorities, and strangely turns more and more rarely in your favor. How frustrating is this, especially if I tell you that fights are super-unbalanced: you will have to face opponents much stronger and faster than you... with long-range and powerful attacks, millisecond reflexes, and the ability to block hits.... while you can't! 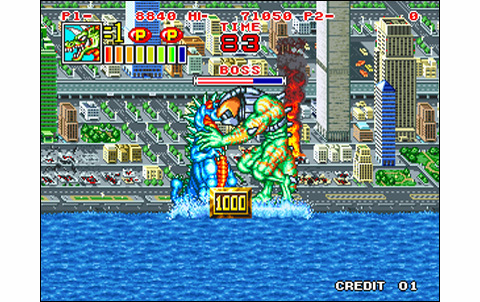 King of the Monsters 2 is a beautiful game, but it's devilishly boring. I won't even talk about the VS mode, literally irrelevant considering the limited range of moves. The difficulty is almost insurmountable and there is no pleasure that emerges, as the gameplay is simplistic and poorly tuned. 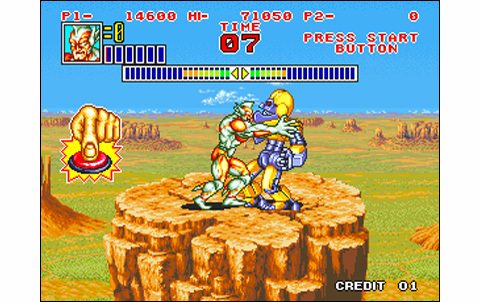 More selectable characters, a decent combat system and real long stages to fight would have been welcome! 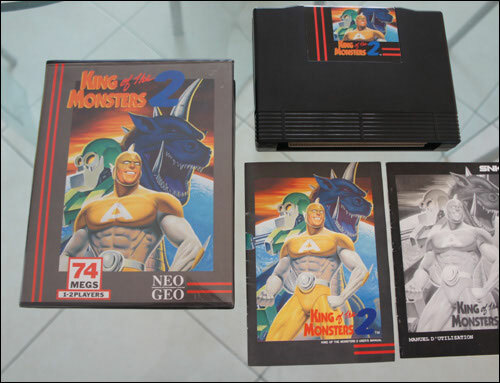 Halfway between VS fighting and Beat 'em Up, KOTM2 joins the graveyard of bad games that haven't been able to choose their side. You'd better go for the first episode, which without standing as a reference, is still providing much more fun! 3/4 view graphics are pretty detailed, beautiful and colorful. 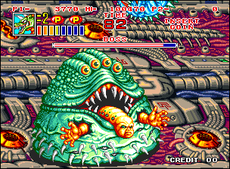 Monsters are original, big and nicely drawn: it's great art! 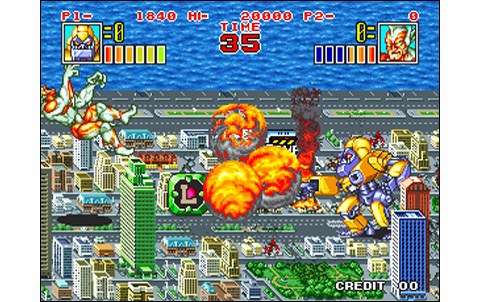 Almost everything can be destroyed and explosions, fires, projectiles are a success. Characters' animation is well made and no slowdowns ever happen! Demonstrating great quality but discrete, sountrack fits well the 'disaster movie' style while effects simply do the job. A poor sequel, far less interesting than the first KOTM. Great realization, but... terrible difficulty and gameplay. A nightmare! The game is not expensive, the graphics are looking really good, as well as the sound, plus the "retro" sensation is here... but even for fifty bucks, it's not worth it. Leave it for collectors or kitsch, giant monsters fevers!